In this itinerary of 10 Day – the Tanzania Wildebeest Migration will occasionally occurs From July, August to September, at the Mara River in Northern Serengeti affords the most dramatic river crossings. At the extreme northern end of the Serengeti National Park, privileged observers can overlook the climax of the mass migration whilst they enjoy the newly conceded comforts of safari travel in Tanzania. Fierce and deep, cliff-sided and rain-swollen, the river takes an enormous toll of the exhausted and terrified wild cattle that surge through its torrential flow, some drowning helplessly, foundering in narrow defiles, floundering in mud, falling victim to crocodile, staggering, exhausted to dry land and often, in confusion, returning to the same scene of their ordeal allowing the cycle to repeat itself..
On arrival at Kilimanjaro Airport your safari guide/driver will pick you and transfer to Arusha city to your allocated accommodation as requested for Dinner and Overnight. You will get chance for briefing and introduction about your safari. Day 2: Arusha to Serengeti (North). 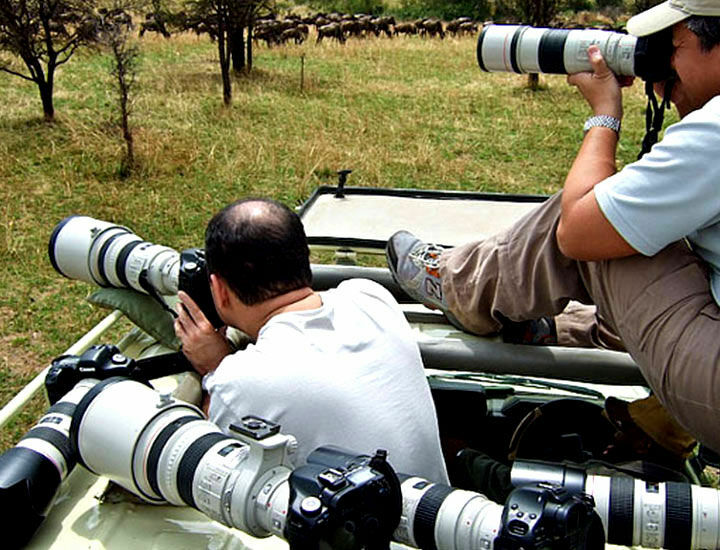 After breakfast to your Hotel the tour will depart to the Northern Serengeti for a game drive in Northern Mara. Serengeti, among other incredible wildlife and stunning views is famed for the annual migration of over 1.5 million wildebeest and hundred thousands of zebras, a frenzied bout of territorial conquests and mating happening from July-October. Witness an actual survival of the fittest as these animals plunge through crocodile-infested waters. The wildebeest produces more than 8,000 calves daily before the 1,000 km (600 mile) pilgrimage begins again. Day 3: Full Day Serengeti North (Koga Tende). After breakfast, the tour depart for Serengeti North for a full day game drive viewing the great migration. River crossings at Kogatende starts in August as the mega herd settles into the area. Between August- October, game viewing is at its best with river crossings pretty much guaranteed every day. There is no distinct movement as the herds tend to cross back and forth over the river, following the rains and subsequent fresh grasses. Day 4: Full Day Serengeti North (Koga Tende). After breakfast, you will proceed for a full day game drive viewing the great migration at Mara area. Resident wildlife numbers are exceptionally high in the Wagakuria area. The key feature is the Mara River and there is a great chance to see the herds cross the Mara River to the north on one day and back south a few days later. Please note that it can be very difficult to witness crossing and is sometimes a matter of luck. A herd can be seen next to river and only decide to cross a couple of days later. This area is a stunning region with kopjes, woodland, riverine vegetation and open plains, similar to Kenya’s Masai Mara Game Reserve. Day 5: Serengeti North to Serengeti National Park (Central Seronera). After breakfast at the camp/lodge, you will drive to Serengeti central, Tanzania’s oldest and most popular national park and a world heritage site. The Serengeti is famed for its annual migration, when some six million hooves pound the open plains, as more than 200,000 zebra and 300,000 Thomson’s gazelle join the wildebeest’s trek for fresh grazing. Yet even when the migration is quiet, the Serengeti offers an amazing game-viewing in Africa: great herds of buffalo, smaller groups of elephant and giraffe, and thousands of eland, topi, kongoni, impala and Grant’s gazelle. After breakfast, you will have a full day game drive in Central Serengeti for the full day game drive. Apart from the large mammals, Serengeti is also home to gaudy agama lizards; Rock hyraxes scuffle around the surfaces of the park’s isolated granite koppies. Wide varieties of dung beetle were found, and around 500 bird species have been recorded ranging from the outsized ostrich and bizarre secretary bird of the open grassland, to the black eagles that soar effortlessly above the Lobo Hills. Day 7: Central Serengeti to Ngorongoro Area. Day 8: Ngorongoro Crater to Arusha. After breakfast, you will descend over 600 meters into the crater to view wildlife for a half day’s safari tour. Supported by a year round water supply and fodder, the Ngorongoro National Park supports a vast variety of animals, which include herds of wildebeest, zebra, buffalo, eland, warthog, hippo, and giant African elephants. Another big draw card to this picturesque national park is its dense population of predators, which include lions, hyenas, jackals, cheetahs and the ever-elusive leopard, which sometimes requires a trained eye to spot. You will visit Lake Magadi, a large but shallow alkaline lake in the southwestern corner, which is one of the main features of the crater. A large number of flamingos, hippos and other water birds can usually been seen here. Late Evening drive from Ngorongoro Crater to Karatu where you will have your Dinner and Overnight at Allocated accommodation as requested. This day it depends to your flight schedule – your safari guide will pick you to the hotel to Kilimanjaro Airport drop off to have your flight for your destination.